Hi friends! I hope you are doing well! We had a ROUGH drop off today at school. Brady was crying and telling me how he didn't want to go to school and he wanted to go home with us. It was hard on me. :( Hopefully, it will get better soon. Ok, today I'm sharing a couple Authentique cards I made a week or so ago at my friend Gina's house. It's always fun to craft with friends! I love these cards and I hope you enjoy them too! 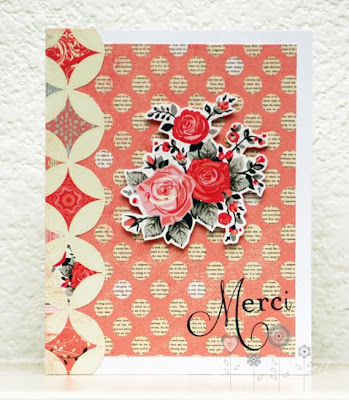 This first one is made with a Hero Arts flower stamp and a Lawn Fawn sentiment. This next one was done with tons of cutting and a PTI sentiment. holy cow! These are beautiful. I love how you fussy cut around the flowers and added the lace and pop dot to the thank you card. So pretty! These are just so gorgeous, friend!! Wow!! These are so pretty :) I hope your drop offs get better~that is always SO hard as a mom :( Heartwrenching! Great cards!!! love the colors. OH MY! I am so sad that Brady had a rough day--I have his package together--I need to send it to him ASAP! I'm on it! As for these cards--wow! I loved them on the video--but I love love love them in these pics! You always take amazing photos! LOVE that second one with the flowers in the center! FABBBBY! THESE are SO PRETTTY!! Love them both!